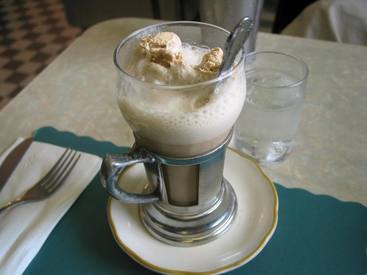 Coffee Ice Cream Soda! Coffee lovers shouldn’t be gloomy this summer. You can still have the delight of having your favorite coffee drinks into a delicious and cold summer treat with this Coffee Ice Cream Soda. This time, have a sip of cold coffee drink in a creamy and bubbly way, the ice cream soda way. Step 1 Mix coffee, sugar and half & half. Step 2 Fill 4 tall glasses about halfway. Step 3 Add 1 scoop of ice cream to each, then fill up with club soda. Step 4 Top with whipped cream.